The Eagle Optics company, which has been in business since the late 1980s, started the Eagle Optics binoculars brand as way to provide quality at reasonable prices. Before the Eagle Optics company was started, though, Dan and Margie Hamilton operated a Wild Birds Unlimited franchise in Madison, Wisconsin. It didn't take long before the Hamiltons and their key staff became binocular experts whose knowledge and helpfulness became well known. They developed a solid reputation as binocular specialists in the Madison area and with other retailers. The resulting binocular sales increases enabled them to make increasingly larger purchases and provide lower prices. They started the Eagle Optics binocular company as a means of further increasing sales through mail order and wholesaling to Wild Birds Unlimited stores and others and their influence with manufacturers increased even more. To best serve their Eagle Optics customers at that time, they focused on stocking the best quality instruments they could get for each price category. Their customers were pleased and told others - which further increased sales and their influence with optics manufacturers. As a natural effect of this increasing influence with manufacturers, they were soon able to persuade them to make models with certain features to make available only for Wild Birds Unlimited stores. That was 1992 and the beginning of Eagle Optics binoculars. Today, Eagle Optics binoculars, along with the company's sister optics brand Vortex, are not limited to any particular retailer and can be found at most major optics retailers. 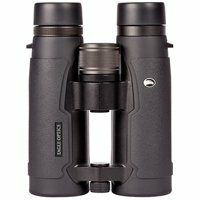 Eagle Optics binoculars are available in assorted models - the Ranger ED, Ranger, Ranger SRT, and Denali models reviewed here have been selected as providing a particularly good viewing experience. Each has an unlimited, unconditional, transferable lifetime warranty and company has earned a reputation for prompt service under warranty - often returning binoculars repaired under warranty in a week or less. 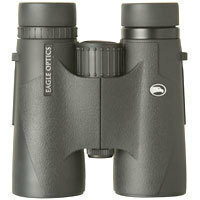 Eagle Optics binoculars will be fixed under warranty whether the fault is yours or due to their design or manufacture. Unfortunately, you won't find the interpupillary distance for Eagle Optics binoculars on its web site. You're not likely to find it on web sites for large optics retailers either, since it's not included in their binoculars' manuals or other literature. You can, however, rely on OpticsReviewer for it - please see the tables below. 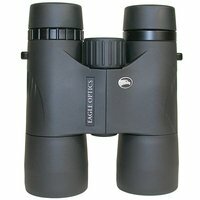 We believe that the Eagle Optics binoculars we consider below present good values. We have no reservations in recommending them as good values for the money. When the budget is stretched, we've nearly always turned to Amazon for a good deal on what we need. It's been our experience that Amazon competes strongly on price and has excellent customer service. In fact, while we're talking about money and prices, we weren't able to find a single online retailer providing Eagle Optics binoculars at a better price than Amazon when we were researcing them. The Eagle Optics Ranger ED model includes the features of the Ranger and (retired) Ranger SRT models. It also has extra-low dispersion glass which typically enhances color, resolution, and contrast. OpticsReviewer research thus far suggests that the Eagle Optics Ranger ED may be remarkably similar to, if not the same as, the Vortex Talon HD. The Eagle Optics Ranger model comes in four different configurations and includes dielectric prism coatings. These coatings increase the transmitted light to approximately 99% of what the naked eye would see. The Ranger provides crisp, clean images. We're favorably impressed with the image clarity and brightness with this model. You may note some chromatic aberration on bright, light-colored images and around the edge of the field of view, although it doesn't seem to be enough to bother most users. Discriminating owners with experience with both binoculars seem to feel the Ranger is equal to or slightly better than the Nikon Monarch ATBs with dielectric prism coating. The Ranger achieves a 5.0 out of 5.0 star rating from owners. The Eagle Optics Denali Model: This model is an excellent introductory binocular or a very solid performer for tight budgets. If you're wondering if you'll enjoy birding as a hobby or you don't necessarily need the resolution and contrast of higher quality optics, or if the budget is straining, the Denali will likely be a good purchase. You should be able to find an Eagle Optics Denali selling for about $200 or less. If you specifically look for it, you're likely to find a slight pin-cushioning distortion (our remarks about the Ranger SRT apply here, too), but it's not likely to be noticeable during normal use. We also feel that the colors seen through the Denali tend just a bit toward the yellow, although not excessively. (If you're not performing a side-by-side comparison with another binocular, you may never notice the color.) If you've been using inexpensive or older binoculars (Porro prism models prior to multi-coating or roof prisms from before phase correction coating was popularized), the Denali model will likely be a very attractive upgrade at a quite reasonable price.